Our Easter range is now live on our website - we have a limited edition Easter Cake, a limited edition Easter Cake slice for Cake Card as well as new Easter card designs and some fun Easter toppers for our whole cakes. 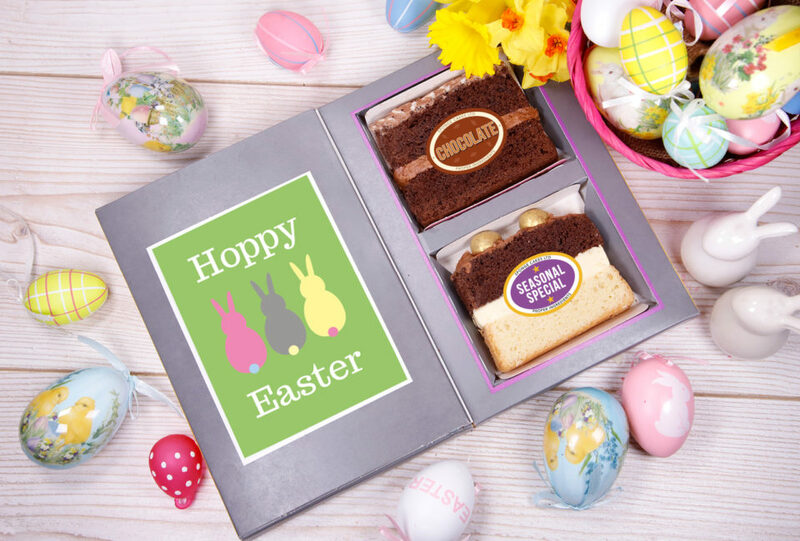 Celebrate Easter with your friends and family with one of our unique easter presents which can be personalised and delivered anywhere in the UK. Indulge in our eggstremely yummy and decadent Easter Sponge Cake. Half vanilla flavoured sponge with raspberry jam and vanilla butter icing topped with speckled coloured eggs and half chocolate sponge with dark chocolate butter icing topped with gold colour dusted eggs. A perfect cake to share with family and friends this Easter as a centrepiece for your Easter party or for dessert after your Easter Sunday meal. Or perhaps you want to gift your loved ones with something a bit different from the usual chocolate egg – our Easter Cake is sure to put a smile on their faces! Our Easter Sponge is a Limited Edtiion and we only have limited numbers available – order now for delivery between now and Easter. Last orders for Easter are 2pm Tuesday 16thApril 2019. Our Easter Sponge stays fresh for up to 10 days so you don’t need to worry about getting it delivered a few days before you need it. You can even freeze our sponges straight away in their packaging for up to six months! 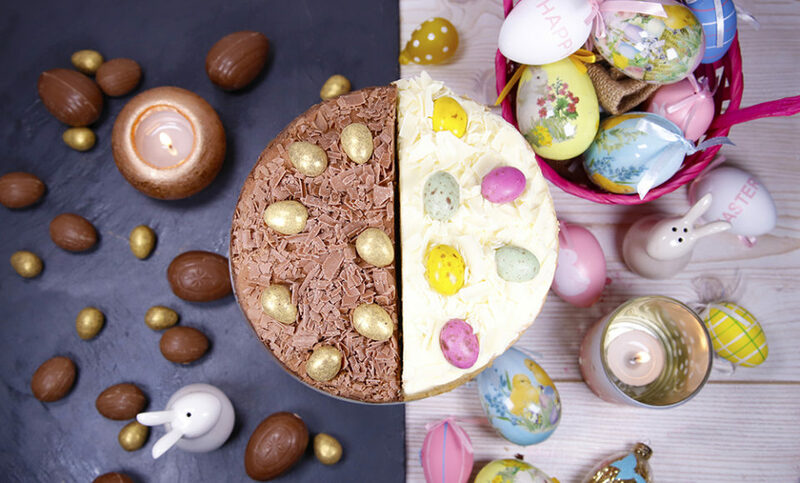 If our Easter Half and Half Sponge us not for you then why not pick your favourite flavour sponge and then top it with one of our fun Easter Cake toppers. Simply pick the flavour you would like, add to basket and choose your topper on the next screen. 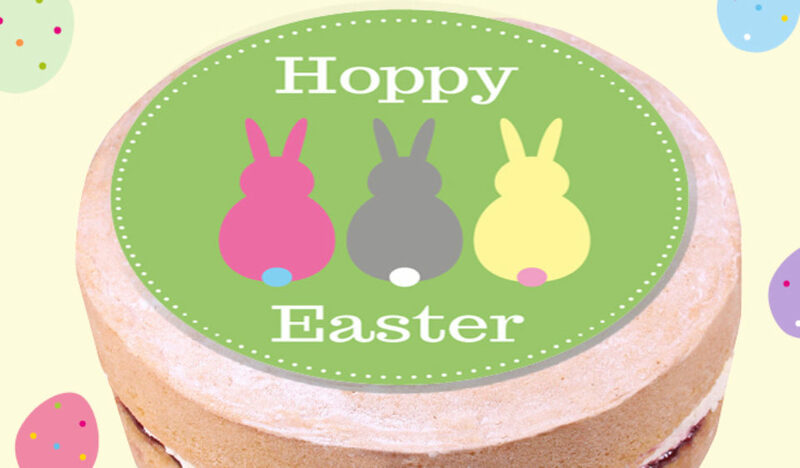 You could even upload your own photo to personalise your Easter Cake or add your own message to the top of your cake. If you can't be with your friends or loved ones over Easter then why not send them some cake in the post to wish them a Happy Easter. Guaranteed to make their day and put a spring in their step! We have lots of funny and unique Easter Greeting Card Designs for the front of your cake card as well as some more traditional designs. 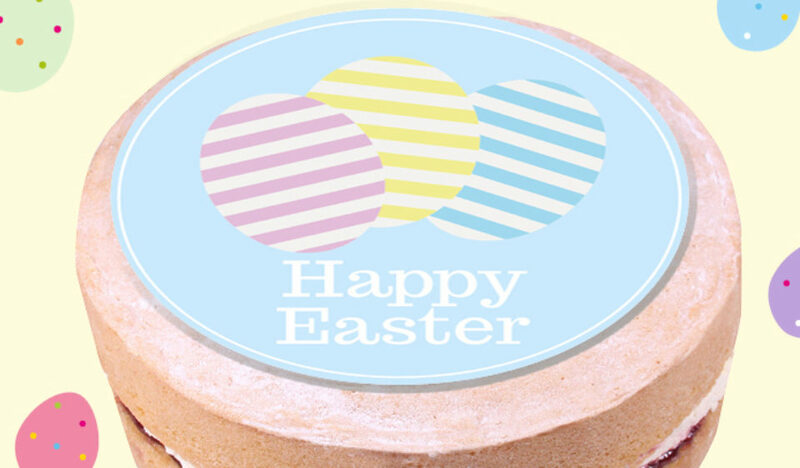 We also have a limited edition Easter Cake Slice for our Cake Cards! 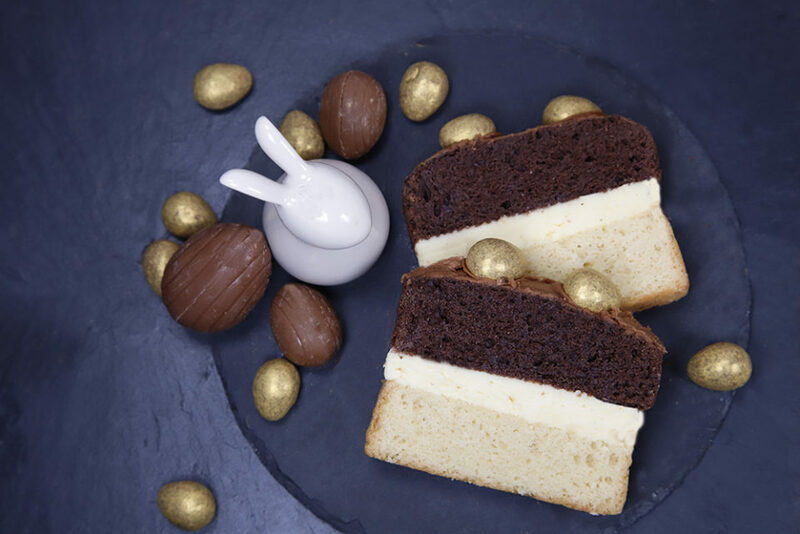 Indulge in our limited edition 'eggstra special' slice - Vanilla and chocolate sponges sandwiched together with toffee and caramel butter icing, topped with chocolate butter icing and with milk chocolate eggs with crunchy caramel pieces and dusted with a gold colour... An eggstremely yummy Easter treat! 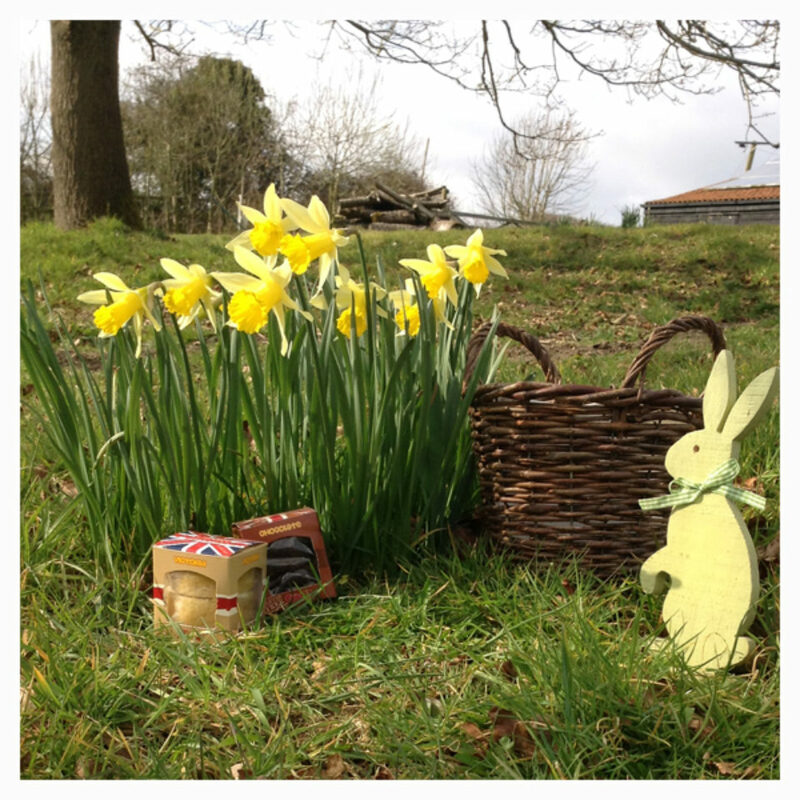 Our Baby Sponge Cakes are great for Easter egg hunts - hide them around the house or outside for your little ones to find! Choose from our pre-selected flavours or choose your own box! Come in boxes of 4, 8, 16 or 32. Over 15 flavours to choose from including gluten and dairy free options.